The Armyworm name comes from the caterpillar life stage of a moth. 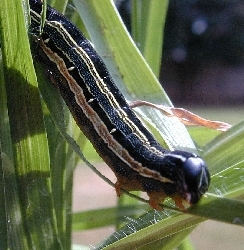 The larva of the Armyworm moth are dull yellow in coloration with an inverted "Y" shape on the head. The larva reach a maximum size of 1.5-2". The primary food sources for the Armyworm range from corn, soybeans, rice, cotton to broad leafed plants. Once a food source is decimated, the Armyworms move to new feeding areas in large hoards, resembling a marching army. The larvae develop through 6 instars within a period of two weeks. Pupation lasts 8-9 days. The adult moth is light gray or tan in color. Adult Armyworm moths are strong fliers and are able to disperse their populations over large distances. Females lay eggs in masses of 100-200 in thick foliage. Over the summer months, the Armyworm is found in almost all states east of the Rocky Mountains in the U.S. In warmer regions such as Florida or Texas, Armyworms can be found year-round and may go through 4 generations in a single year. The larval stage are commonly found near their food sources such as in gardens, fields, or grasslands. Armyworms have proven to be one of the more difficult insect pests to control. Population explosions can result in devistating losses to crops, particularly corn and hay. Genetically modified crops and numerous insecticides have been developed with mixed results. From a scientific perspective, Armyworms are of interest while studying recombinant protein expression in response to insect-specific viruses. Capinera, John L. "Featured Creatures: Fall Armyworm". University of Florida IFAS. 23 April 2013. Retrieved from: http://entnemdept.ufl.edu/creatures/field/fall_armyworm.htm.